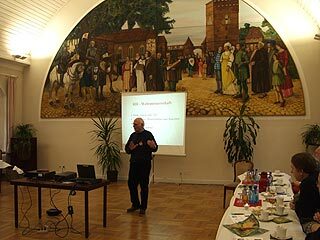 Saturday, 22nd November 03, the organizer invited the representatives of the town of Wittstock, headed by mayor Lutz Scheidemann, the head of the small businesses of the region Ostpregnitz, the representative of the police and the press for a mutual briefing. At first the guests got to see a demonstration of an urban search at the training facility. An unknown number of “Victims” had to be located by the SAR-teams. Two regional TV-stations aired a report about this demo in the evening program. In addition the president of the BRH, Helmut Haller, introduced the representatives of the BRH and the IRO and informed about the intention and goals of a SAR World Championship. They discussed the program and everything necessary to run the event smoothly. The meeting was ended with the film "From puppy to SAR-dog". In the evening the cooperation with the Bundeswehr (German Army) during the event has been discussed with Oberstleutnant Engel. Everyone agreed that this meeting has been extremely informative and educative. They thanked the members of the BRH-team Brandenburg for the outstanding organization and promised to come back in April 04.